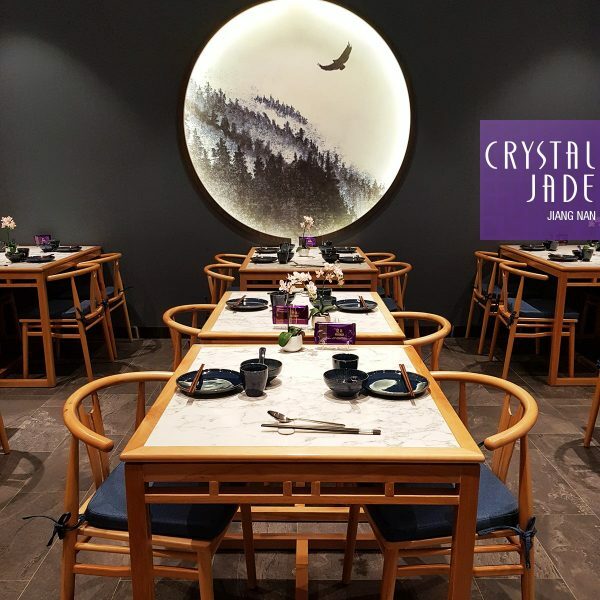 Inspired by the cuisine and lush landscapes of the Jiangnan region, Crystal Jade Jiang Nan at Vivocity has reopened with a refined and creative menu that encourages communal dining. 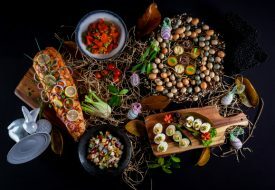 The menu features a wide selection of Jiangnan-inspired cuisine, as well as select Sichuan specialities curated by Group Executive Chef Martin Foo and his team of expert chefs; some reinvented with his distinct modern touch. 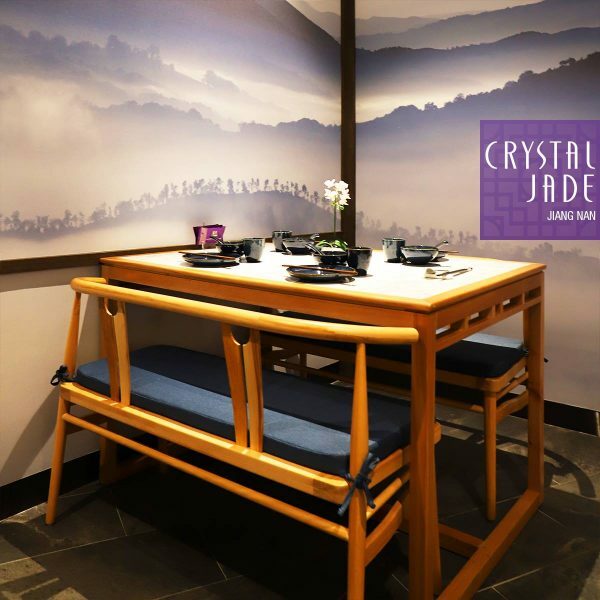 The restaurant’s interior features soothing teal and grey accents and elegant furnishings, with landscape pieces showcasing the beautiful mountains of the Jiangnan region. Cherry blossom motifs on the ceiling, lattice panels and light wood marble-top tables further add to the air of refinement about the place. 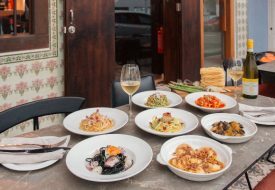 Jinhua ham and Shaoxing wine are two well-known products from the Jiangnan region, and you’ll find them in many of the dishes on the menu. 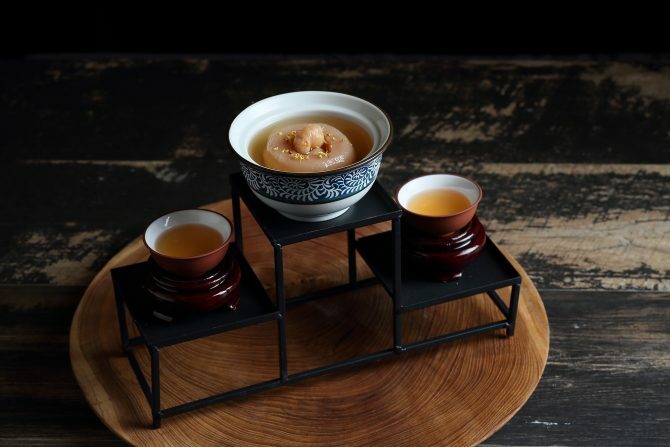 Start your meal the traditional Chinese way by having a cold appetiser! 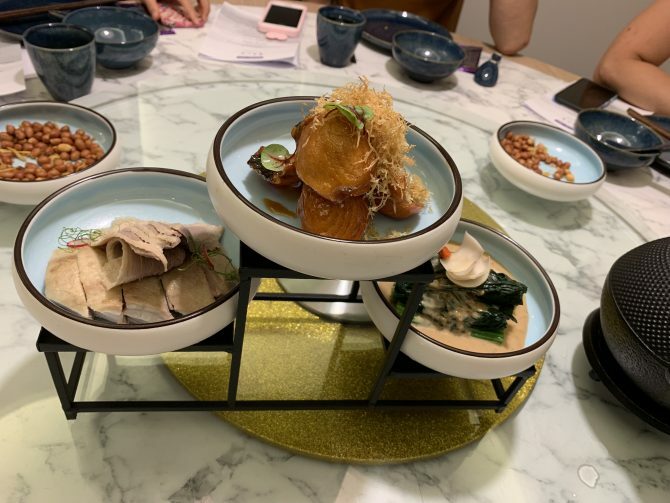 We loved the Three Delicacies Platter (S$16.80 per portion); a trio of chilled Nanjing salted duck slices, chilled spinach and fresh lily bulbs with sesame sauce, and Jiangsu smoked fish. The latter of the three, and our favourite, is a delicacy of spice-marinated grass carp fish pieces which are first flash-fried, then covered in a fragrant sauce prepared with Shaoxing wine, black vinegar, brown sugar and dark soy sauce. The spinach too, was wonderfully aromatic with the flavour of sesame and sweetness of the lily bulbs. 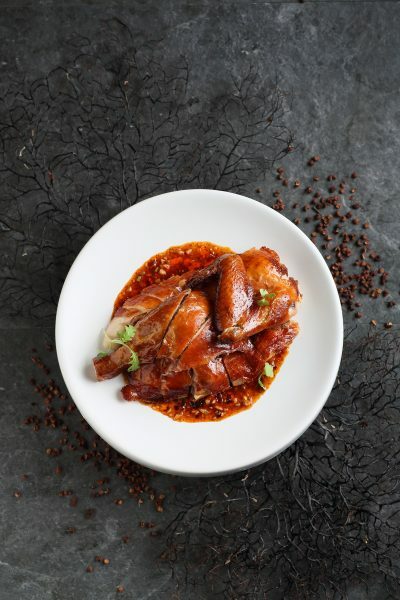 Other classic cold appetisers you can order include the Iced Drunken Chicken ($11.80 per portion) covered in an aromatic Huadiao wine granita; and Chilled Sliced Pork with Signature Minced Garlic & Chilli Oil for those who prefer a spicier kick to start their meal. 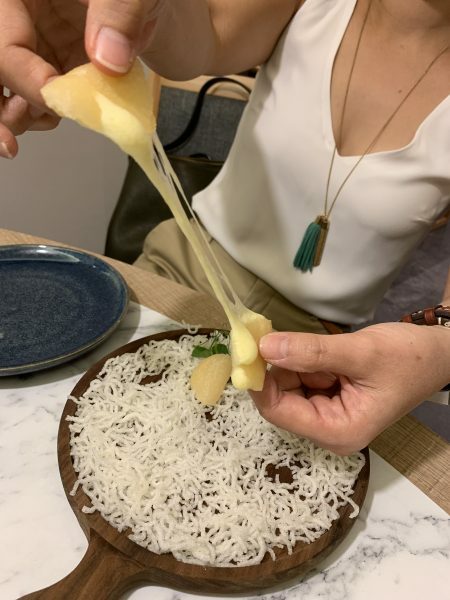 For cheese-lovers, Chef Foo has also created a Cheesy Crisp Mochi Ball ($10.80 for 6 pcs): a lightly crisp and sweet mochi exterior with a gloriously stretchy mozzarella cheese centre. Get your phone cameras ready for a cheese-pull boomerang – but beware of the piping hot cheese! Afterwards, slurp down nourishing soups – because what’s an Asian or Chinese meal without a soup of some kind? Take your pick from Song’s Thick Fish Soup (S$9.80 per person), the meaty Double-boiled ‘Lion Head’ Meatballs Broth (S$8.80 per person), or our favourite: Double-boiled Conpoy & Chrysanthemum Soup with Pearl Abalone (S$18.80 per person). This came served in a lovely traditional zisha teapot that reminded us of wedding tea ceremonies; and is a wholesome and tasty brew fortified with wolfberries, pork and red dates. For mains, those who still can’t get enough of mala would love the Mala Crispy Roasted Chicken (S$15.80/half, S$29.80/whole). Served with homemade mala sauce, the chicken was delightfully tender and its skin crispy. A less common but no less delicious Jiangnan specialty would be the Steamed Yellow Croaker with Chinese Wine (S$28.80 per portion, approximately 400g). 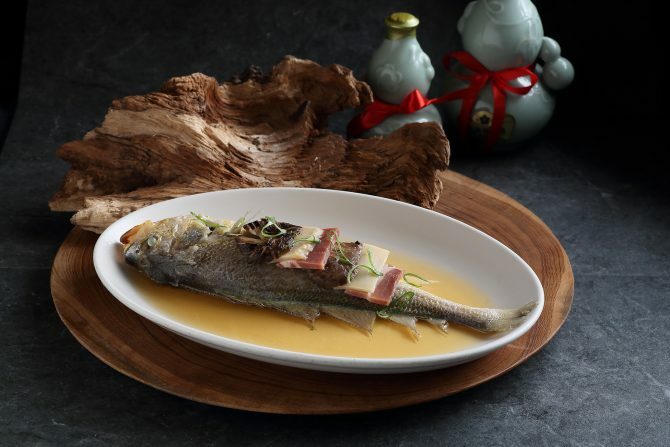 Perfumed with the aroma of Shaoxing wine, the fish was fresh and sweet, pairing well with the sauce. 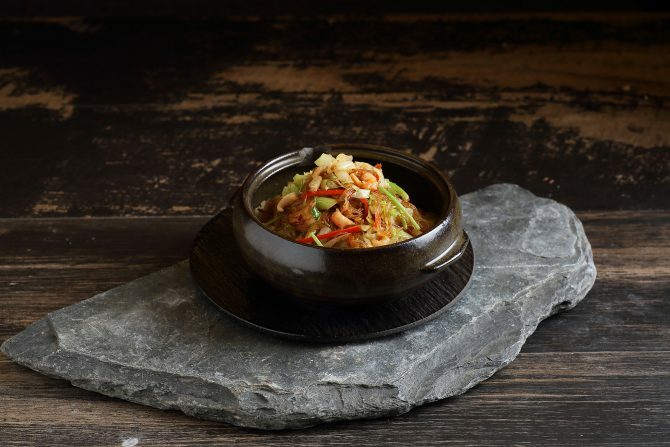 Don’t miss out on the stir-fry dishes either! The Sautéed Dried Shrimp & Vermicelli with Cabbage (S$13.80 per portion) may sound and look unappealing or plain, but we assure you, it was anything but! Redolent with wokhei (fragrance of the wok), this wok-fried dish took us by surprise with its sweet crunchy cabbage, QQ vermicelli, and an aftertaste of numbing spiciness from the Szechuan peppercorns used. Fans of fried rice should also give the Crystal Jade Yangzhou Fried “Rice Shaped Pasta” (S$16.80 per portion) a try! Chef Foo gave this classic, well-known Jiangnan dish his own unique twist. 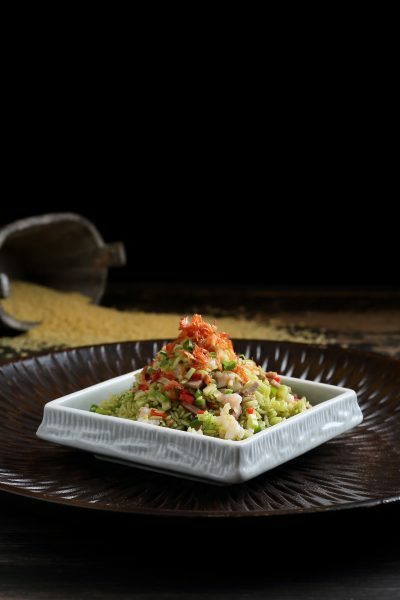 The “rice” is replaced with orzo; a short-cut pasta, and covered in a fragrant spring onion blend, before being fried with asparagus, shrimp and egg and topped with sakura ebi. 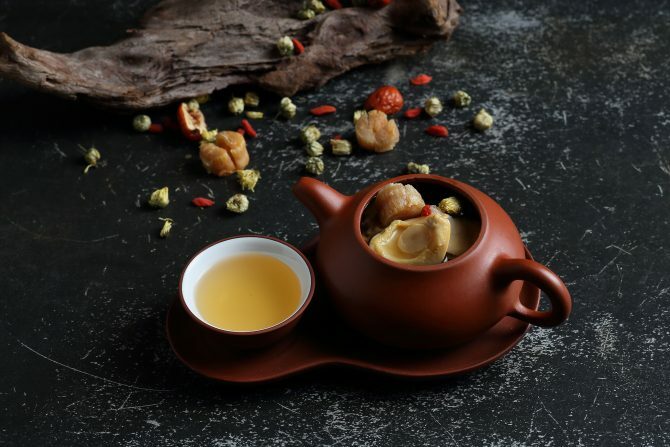 Finish off your meal with the cool and refreshing Double-boiled Snow Pear with Osmanthus (S$7.80 per person), a dessert soup that wasn’t too sweet or heavily-scented with osmanthus; making it a lovely well-balanced dessert that Ah Ma would approve of. 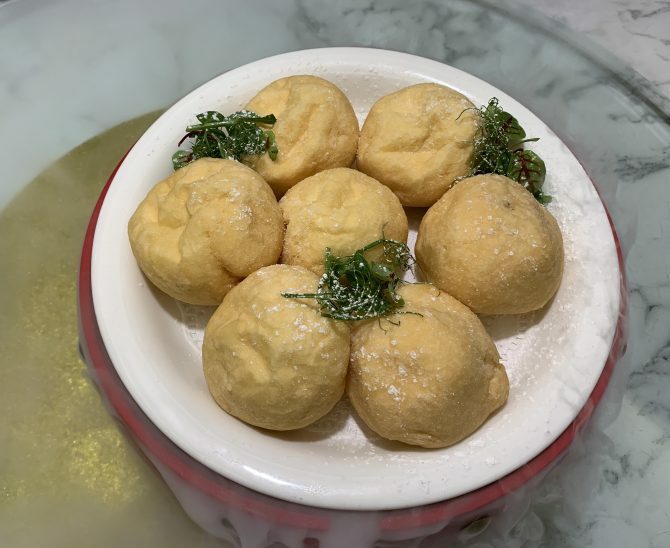 A more creative dessert option would be the Soufflé Egg White Ball With Red Bean & Banana (S$8.80 for 3 pieces); steaming hot, fluffy cloud with a smooth red bean and banana filling. 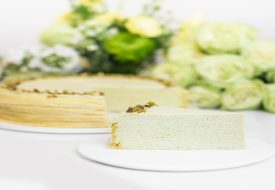 With an extensive menu of both traditional and creative culinary delights and an elegant dining interior, Crystal Jade Jiang Nan would be a wonderful place for business meetings or family reunions; where you can sip on some Snow Chrysanthemum tea and tuck into delicious dishes from the Jiangnan region.